We always knew Julie Dewald, manager of our Atlanta showroom, had a great eye for design, and when we saw her home in Marietta, Georgia, we knew we had to share it with you. Julie’s thoughtful touches are evident throughout, as she carefully considered how each room would be used. Today we’ll tour their family room, living room, master suite and outdoor patio. This family room sectional creates an inviting, comfortable spot to lounge for everyone, including Tippy the dog. Adding a swivel chair and poufs for extra seating makes every part of the room functional. 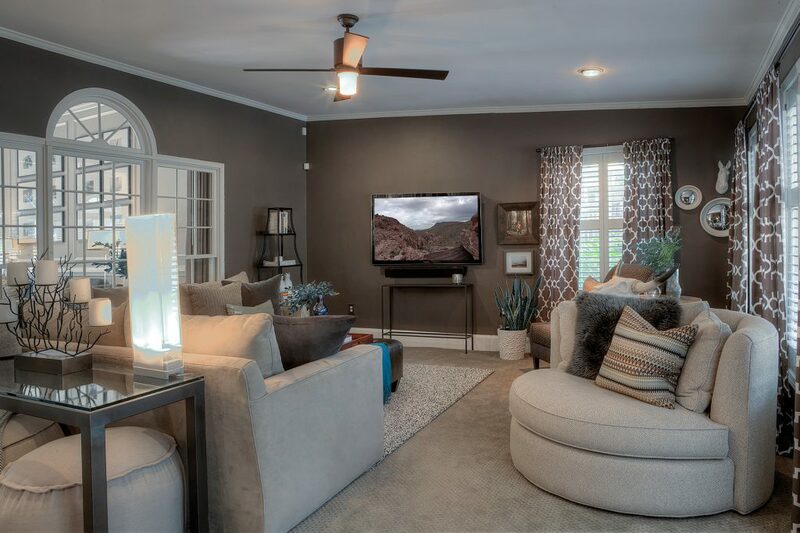 The family room is an excellent example of how to make a neutral, tonal color palette work. “We chose colors that blended well, but were in the same color family. There are subtle patterns in the accent chairs and the pillows that create a soft, but interesting, look.” Julie changes pillows with the seasons. “I love Room & Board pillows. They add just the right amount of color and texture.” For additional softness underfoot and to anchor the space, Julie placed an Arden rug over the carpeting in front of her sectional. A study in neutrals, featuring the Eos accent chair. 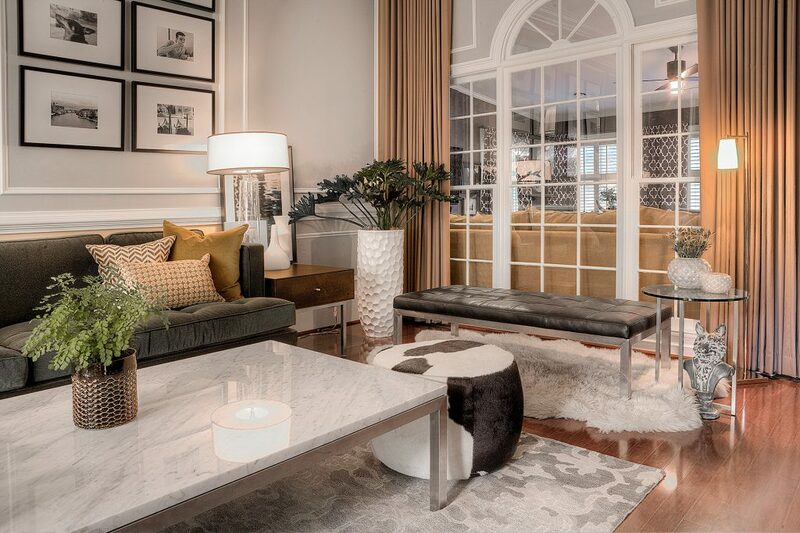 The formal living room is our next stop in the home tour. Julie and her husband use this room more often in the winter because the fireplace keeps it cozy and warm. They updated the fireplace, making it a focal point by bringing in natural texture with stacked stones and a wood mantel. Julie carefully positioned the furniture to provide a comfortable space for conversations between people in the living room and the nearby kitchen. Murphy the dog perches on the Quinn ottoman. Also shown are two Quinn chairs and the Adams end table. 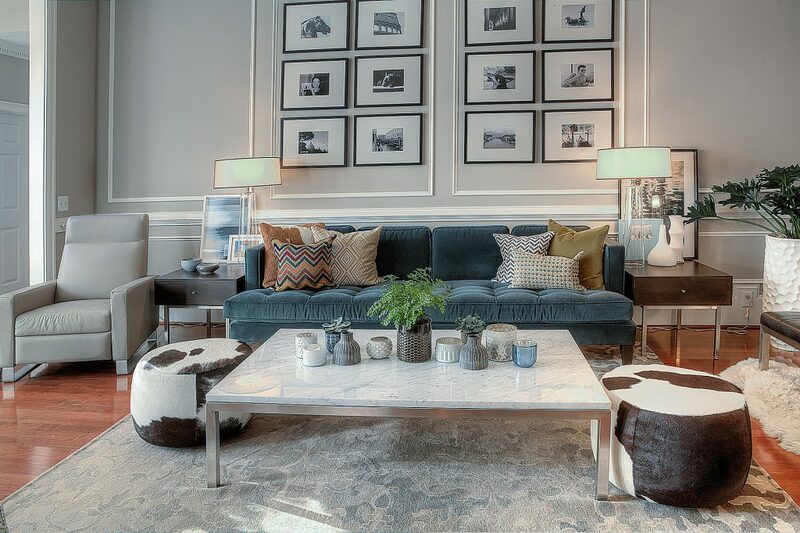 Throughout the living room, Julie used a mix of leather, patterns, velvet and cowhide. “Give yourself permission to try different materials together. It’s a new year—try something outside of your comfort zone,” she recommends. Her dogs appreciate the room, too. 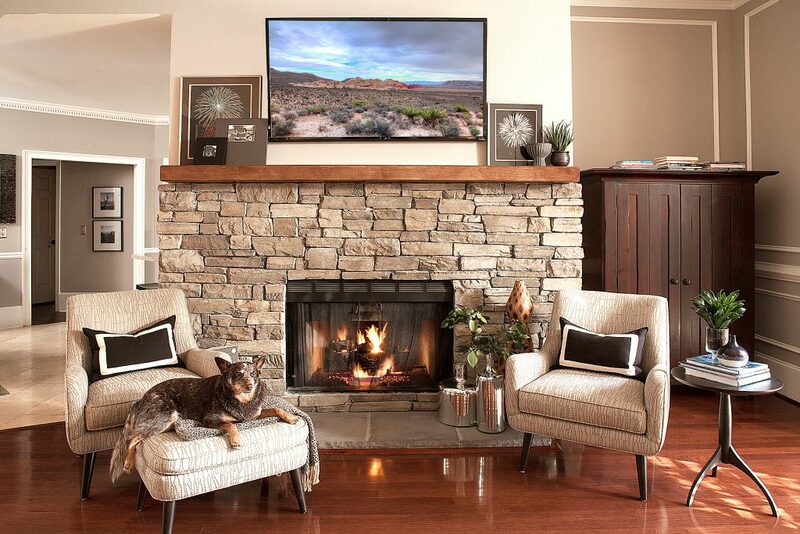 “Our pups love the Lind and Quinn ottomans, especially in front of the fireplace on cold nights,” Julie confides. This Hutton sofa is paired with a comfortable Dalton recliner and Portica coffee table with marble top. The leather Ravella bench provides extra seating and a view into the adjacent room. Other touches include a Classic end table and neutral rugs to anchor the space. Shell finish on the Delano dressers complements the light grey upholstery on the Marlo bed. 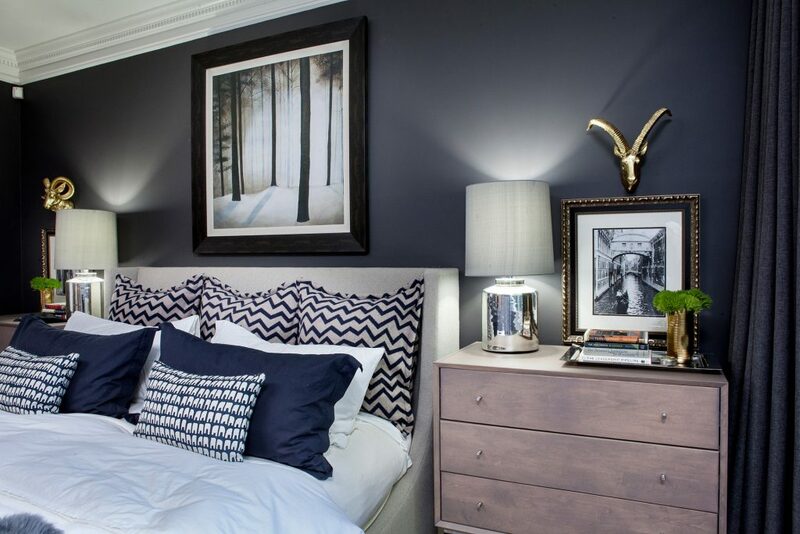 Julie told us the inspiration for the bedroom came directly from the paint color. “I wanted to design my bedroom so I could close the drapery and have a quiet, dark, comfortable place to rest any time of day,” she says. The room receives plenty of natural light, so the dark paint feels appropriate for the space. A Hudson dresser with shell finish provides a subtle contrast. 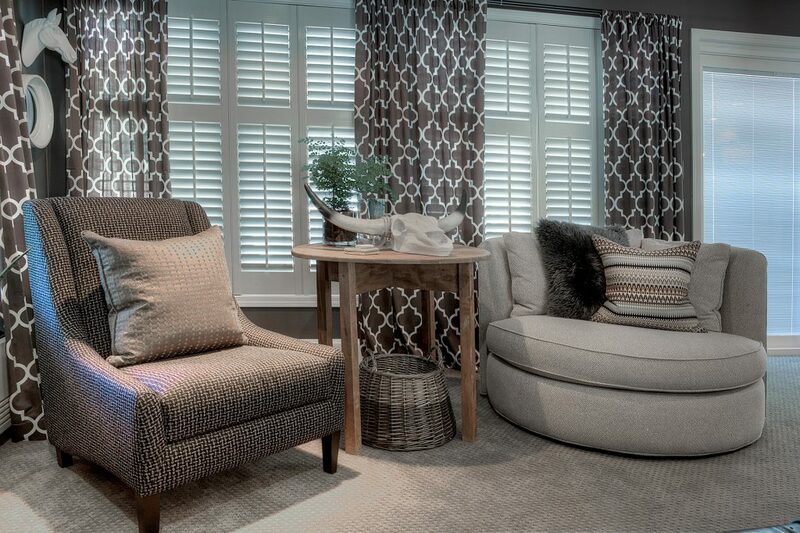 A Louis accent chair in a patterned fabric adds interest to the room. “We chose to use Delano three-drawer dressers as nightstands because they provide plenty of storage—and I love the scale with the king-size bed. A smaller nightstand felt out of place with the size of the bed,” Julie explains. The master bath is right off the bedroom and had wall-to-wall carpet when the couple moved in. They kept it like that for years until they decided how the two rooms would flow together. 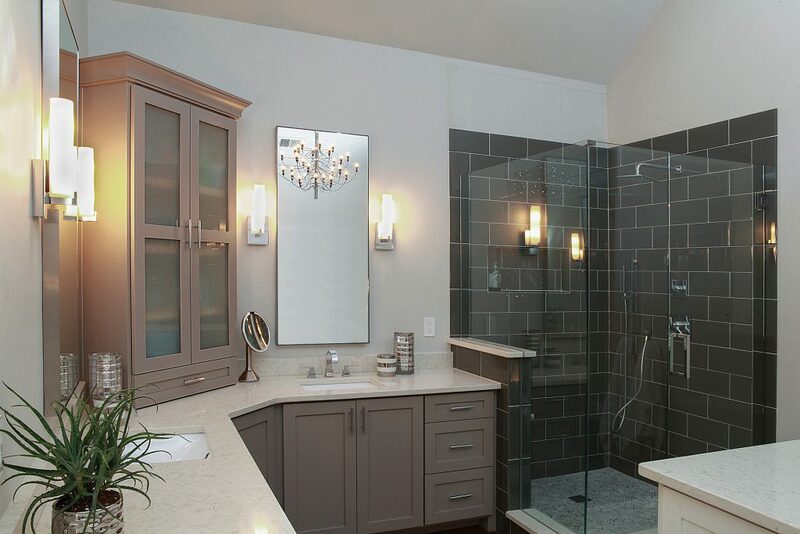 “The project was centered around the shower. The tiles I loved so I worked from there,” Julie says. “I designed the center island on a scrap of paper and worked with our contractor to create a great piece for storage. I find myself hanging out in this space a lot.” Julie also told us that using grey tones was a great way to add a modern touch to the traditional lines of the room. 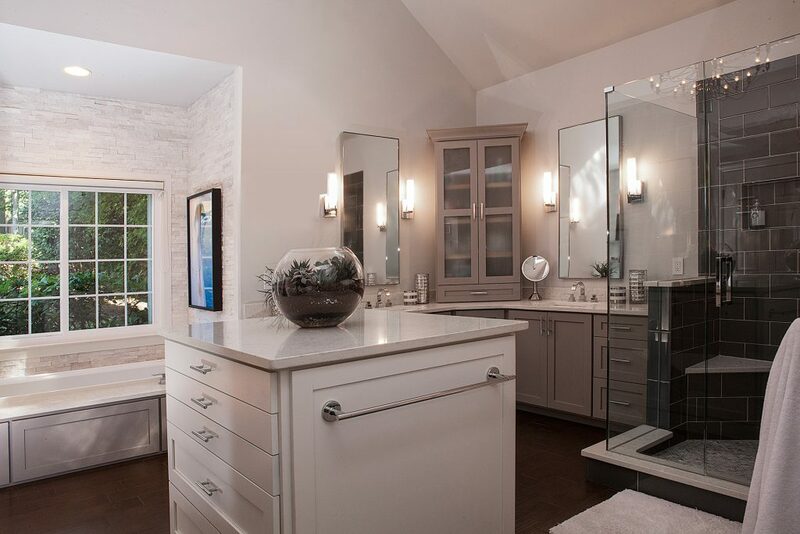 Julie needed mirrors that would work with the high ceiling in her bath. She chose custom Infinity mirrors to get the perfect size for her space. 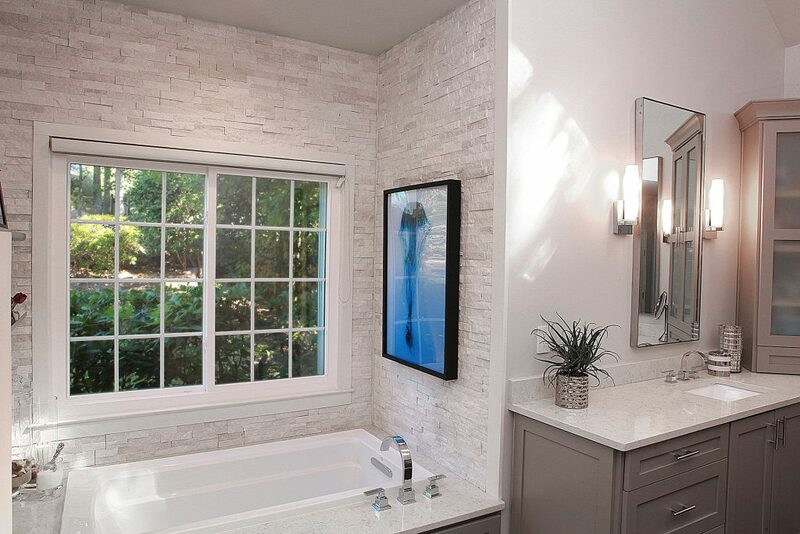 She hung a limited edition Roberta Allen photograph in the tub alcove to provide a dash of color and because the jellyfish just felt right near the water. 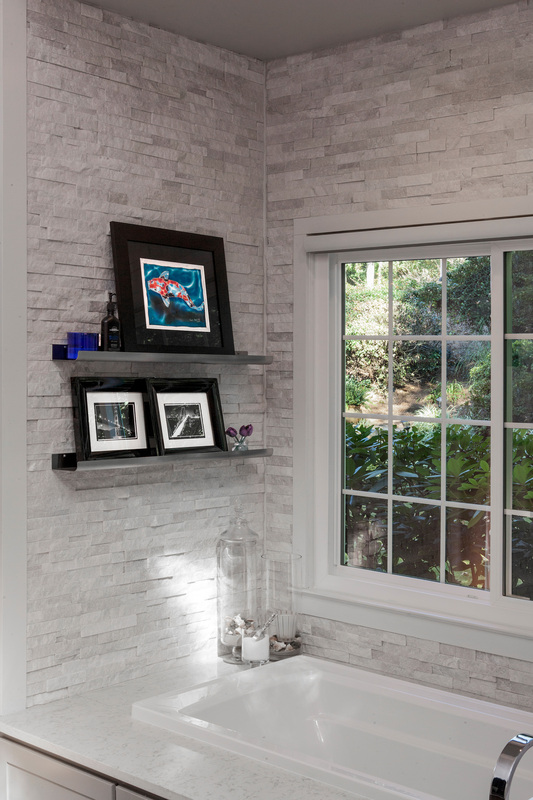 Trace picture ledges allow Julie to display more travel photos while Elise floor lamps provide soft, ambient lighting when enjoying the tub. 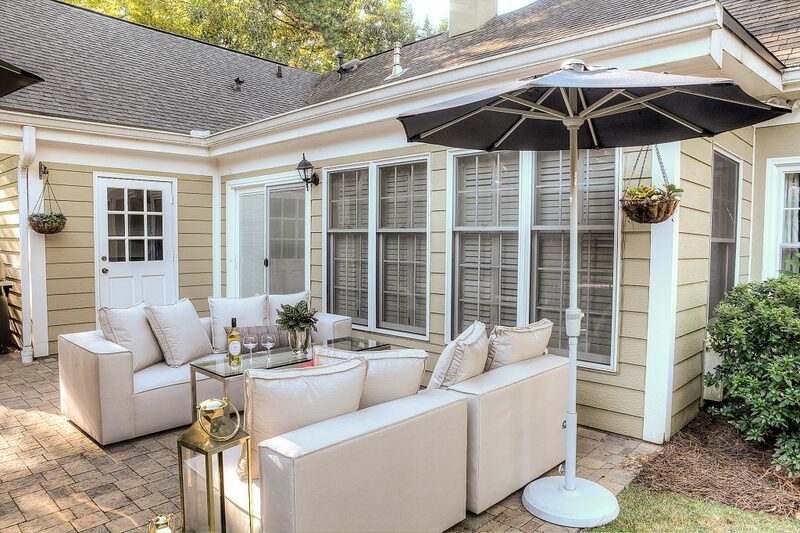 Julie and her husband wanted their outdoor space to be as lovely and functional as the interior of their home. With two dogs, it was especially important to have more green space. Julie told us when they purchased the home, it had very little yard. “We gutted the entire backyard and started fresh. The patio gives us a place for dinner—it’s a relaxing spot to unwind after work,” Julie says. Portica outdoor table is a comfortable height to use as a dining table or as a coffee table. 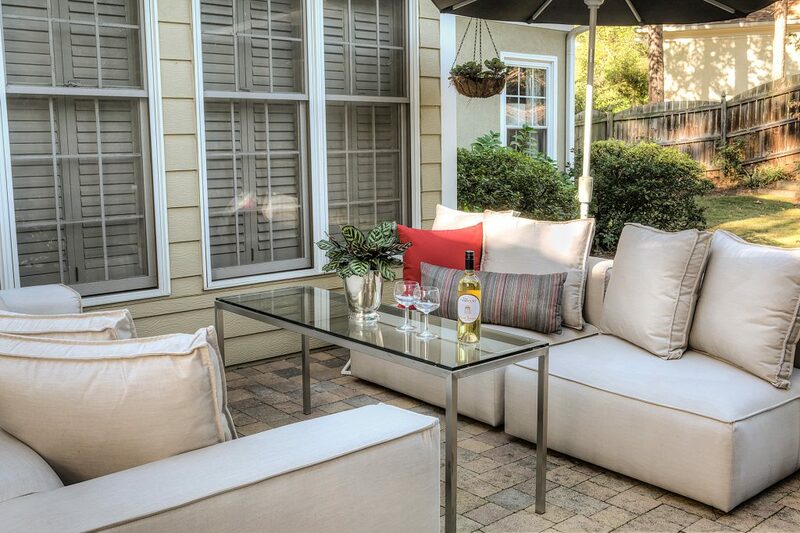 Oasis sofa and armless chairs create a true outdoor living room that’s comfortable and stylish. The couple uses the Emmet rocker chairs the most often. (Julie’s tip: A Cruz chair cushion fits the Emmet perfectly for extra comfort.) 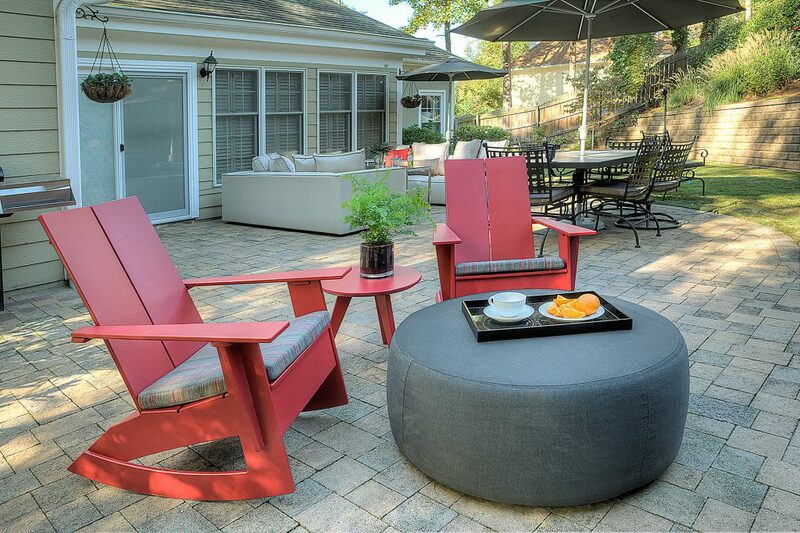 Their custom Lind ottoman pulls double duty as a coffee table or extra seating for guests. Can you tell me what color you used on the walls in the bedroom. Also, would love to know where you got the pillows and lamps. Love that room!! So relaxing. We checked in with Julie, the homeowner, to get the answers to your questions. 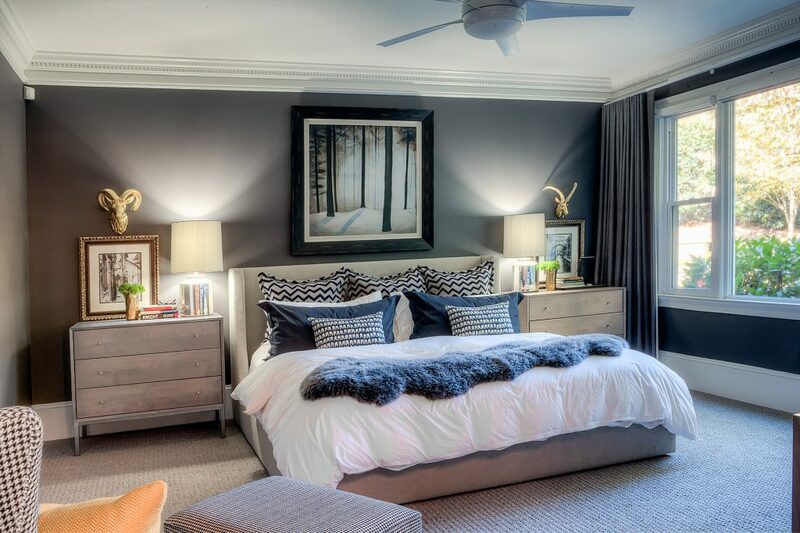 *The bedroom paint is Benjamin Moore Iron Mountain 2134-30. *The smaller throw pillows are Room & Board Row pillows in indigo. Thank you for your questions! Please let us know if we can help further.